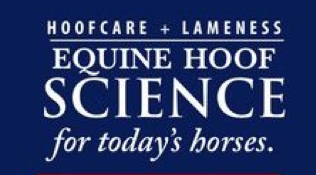 HoofSearch, the index of equine hoof research, has been compiling a bibliography that documents the progress of hoof science on a year by year basis. What were the leading publications back in 1919, and who were the authors? One hundred years ago, the world was sighing in relief with the end of World War I, even though the Treaty of Versailles wouldn't be signed until June. Veterinary and farrier journals were thin. In fact, it's difficult to find much that was published on the horse's foot in 1919; much more attention was paid to infectious diseases like glanders. Nonetheless, what was published is worth detailing here. Life in general that year was dominated by the tragedy of a third wave of the Spanish Flu pandemic; over a two-year period, an estimated 500 million people around the world became ill, and 50 to 100 million died. 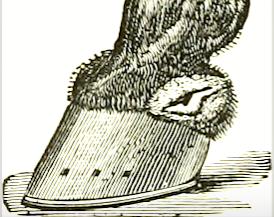 Even though Germany was debilitated after losing the war, and reeling from the punishing terms of the treaty, hoof science was marching forward, however tentatively, with a hoof-related doctoral thesis published that year, by Haase at the University of Dresden's hoof institute on the characteristics of the hoof epidermis. Switzerland, of course, had been neutral during the war; two articles were published in 1919 in that country's horseshoeing journal, Schweiz Hufschmied: Schneider on bone, joint, ligament and tendon diseases of the distal limb and Schwendimann on the effect of trimming the hoof quarters in preparation for shoeing. In the United States, only one article could be found that was published in 1919 exclusively on the horse's foot. The Cornell Veterinarian published the proceedings of the 28th Annual Meeting of the New York State Veterinary Medical Society, held at Ithaca the previous July. A detailed paper by Brooklyn, New York equine veterinarian R. W. Gannett of the Berns Veterinary Hospital is a rich account of the foot diseases affecting urban horses working the city streets during the war years and, in particular, Gannett's surgical solutions to the problems that plagued them, like quittor. Horse and Stock Book, published in 1903. "In these days of antiseptic surgery the old practice of treating a wound of the foot by leaving orders to renew the oil meal poultice is no longer looked upon with favor by the intelligent horse owner," Gannett began. He credited quick veterinary intervention for the new successes in treating urban horses: "In stables where every calk, nail and interfering wound of the foot is given prompt attention by a careful veterinarian, the number of cases of tetanus, pododermatitis, septicaemia, quittors and resections are reduced to a minimum." His description of the prevalence of quittor is surprising, given how uncommon the problem is today. "In city practice quittor or necrosis of the lateral cartilage is the most common chronic affection of the horse's foot. Gangrenous dermatitis or sloughing of the skin of the pastern and coronet in our experience causes fully 75% of all quittors. "Next in importance as causative factors I would place corns; pododermatitis, injuries to the quarter and quarter cracks." Today, quittor is still with us but not often seen; a 2012 paper in the journal UK-Vet by University of Liverpool Senior Lecturer in Equine Orthopaedics Peter Milner and the University's vet school remedial farrier Ian Hughes describes it this way, "Quittor describes infection of the ungulate cartilages of the foot and may result in lameness, swelling and chronic discharging tracts from the coronary band. Often these cases require surgical intervention, during which part of the hoof wall is often removed. This may lead to reduced support by the hoof wall and additional stresses on remaining structures. Remedial farriery involving trimming and digital support is often key to the immediate and long-term management of these cases." But it was the urban horses that garnered most of the attention during the early 20th century. Gannett reported performing surgery on 105 quittor cases operated at Brooklyn's Berns Veterinary Hospital over the previous four years, and documented that 100 had made good recoveries. A simplified anatomy diagram of the ungual cartilages (b) from the classic book, Diseases Of The Horse's Foot, by H. Caulton Reeks, in 1906. Reeks describes four types of quittor. Driving a lame horse in New York City in 1919 was a criminal act. ASPCA records document a court case of a driver jailed and fined $500 for driving a horse he knew had a quittor; he claimed his employer had instructed him to drive the horse regardless of its condition. The wound was discharging blood and pus. If Gannett's 25 cases of quittor a year sounds like a lot, consider this: In an article published in the Veterinary Journal in 1917, Major Victor C. Leckie, of the British Army Veterinary Corps, described a French method for quittor surgery on military horses that was carried out on 217 cases in four months during World War I. That is more than one case per day. Fast forward to 1944, and move out of the city and west to the rural horses documented in the pages of Iowa State University's journal; V.M. Reinhart, DVM wrote about quittor from the point of view of wire cuts on the pastern that became infected, and involved the lateral cartilages. "At least 75 recovered with sound hoofs, probably 25 have a quarter crack near the heel, and at least 90% of recovered cases are ready for steady work in from four to six weeks." "Of the five that died or were destroyed, one developed an open navicular bursa, two died of septicemia and two were destroyed because the corono-pedal joint became infected. "Included in the recovered list are three that were fired and blistered for ringbone as a sequel of the operation; also one horse that had quittors on both hind feet at once, and another that was operated upon for quittor and open navicular bursa at the same time. This horse worked slightly lame for two years when chronic tendonitis appeared. Median neurotomy was performed with success, and the animal is still at work. "In only two cases was the cartilage partially removed; both suffered a relapse, necessitating a second operation and the complete removal of the lateral cartilage. 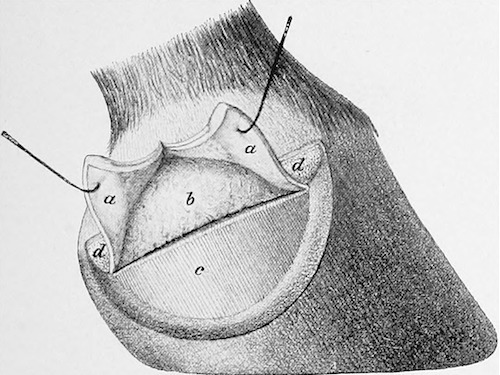 Whenever possible, we endeavor to operate without dividing the coronary band, but for the beginner or one inexperienced, I think it advisable to make one incision toward the heel, as it is better to risk a quarter crack than to take chances on opening the corono-pedal articulation, or leaving a portion of the cartilage,which is very apt to become necrotic. "Conditions occasionally arise in which it is necessary to sacrifice the entire coronary cushion of the quarter, as in the case of an extensive parenchymatous pododermatitis, but I can see no reason why, in the ordinary quittor, the coronary band should be removed if an operating table is to be had, and ordinary after care can be given. "If the surgeon must operate upon the animal cast in unclean surroundings, and after care is uncertain, I believe that complete excision of the coronary band hoof, skin and lamina covering the lateral cartilage, together with the complete removal of the cartilage itself, is the quickest and safest method. This is recommended by certain surgeons at the Front, and it can readily be seen that conditions might be such as to justify this method." Gannett also described other foot conditions faced by the city horses, but didn't waste many words on laminitis. On this, he said: "Laminitis is so common and well known to all of you that I hesitate to mention this condition." However, he did point out the popular use of the Cochran shoe on city horses with dropped sole, which will be covered in a future article. "...There is no other class of diseases in which careful, intelligent treatment will produce such good results as in diseases of the foot of the horse. It takes five years to raise a horse. A veterinarian may save a bad foot case by a few minutes' judicious use of the knife. "We cannot all serve at the front; but we should do our utmost here at home not only for the owner, for the horse and ourselves, but most of all for the sake of humanity." It was the only paper Gannett ever published. I hope that finding it and sharing it with you will hopefully keep his name and dedication alive for another hundred years. Note: The passages from Gannett quoted are excerpts; the article is quite long and should be read in full if you are interested in quittor. 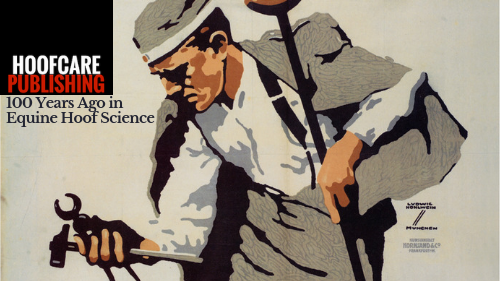 The top graphic is a German poster by designer Ludwig Hohlwein, created in 1918 at war's end to promote a fundraiser for disabled war veterans. It is now at the Imperial War Museum in London. Gannett, R. W. (1919). Clinical observations of foot diseases of the horse. The Cornell Veterinarian, 9, 22. Leckie, Victor C. The French Operation for Quittor. The Veterinary Journal (1900) 73, no. 10 (1917): 362-365. Reinhart, V. M. (1944). Quittor: Outline of surgery and treatment. Iowa State University Veterinarian, 6(4), 5. Milner, P., & Hughes, I. (2012). Remedial farriery Part 3: The role of farriery in the surgical management of quittor in the horse. UK Vet Companion Animal, 17(1), 4-7. 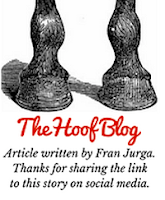 Click here to subscribe to HoofSearch. Click here to learn more about HoofSearch and how it can help you stay current with new research.